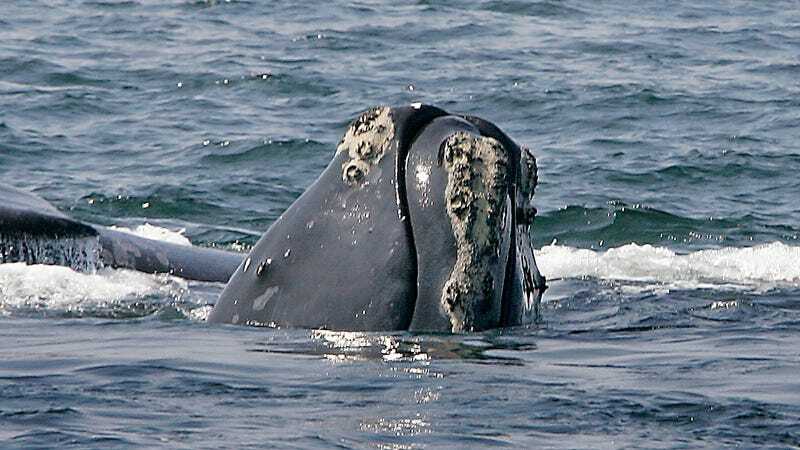 The worldwide population of North Atlantic right whales has dwindled to just 450, with 17 having died this year alone. Experts say it’s now time to face the reality that the species could go extinct unless immediate steps are taken to save them. I’m not a gamblin’ man, but I’d say our odds of leaping to action aren’t great. This rather upsetting turn of events was revealed last week at a meeting of the regulatory New England Fishery Management Council, during which officials with the National Oceanic and Atmospheric Administration said that the whales’ numbers have plummeted since 2010. According to The Guardian, a year of high mortality has coincided with a year of poor reproduction, exacerbated by the fact that the population of female whales have shrunk faster than their male counterparts—currently, there are only around 100 breeding females left. Aggressive commercial whaling brought the animals to the edge of extinction by the 1890s, and though that practice is no longer common, human activity is still responsible for helping to kill them off. In recent times, the leading cause of mortality is entanglement in fishing gear, as well as vessel strikes. On one hand, it’s a relief that the whales aren’t dying en masse due to a more systemic culprit, like climate change (though that is playing a part). On the other hand, nets continue to be hazardous to other types of marine life as well, not that the U.S. is doing anything to help: In June, the Trump administration announced it would be rolling back newly-implemented restrictions on swordfish nets, despite the danger they pose to several species like whales, dolphins and sea turtles. Well, cool. I guess we can always just look at some photos.